Maybe there is some type of osmosis happening in generation potters. How else can I explain the fine throwing and shapes of the young ceramist Kako Katsumi. Both his grandfather (deceased) and his father (living) work as throwers for a Kiyomizu-yaki production kiln. Just as in the past, certain jobs around the kiln are regulated, so you have a thrower, a person who paints designs on pieces, and those who fire the kiln. Kako grew up watching his grandpa and dad and I suspect some type of "natural learning" occurred, which is really impossible to actually prove. Yet, there is proof in my eyes looking at his fine tokkuri and guinomi. His tokkuri fit nicely in the hands. The two pictured here have a triangular base where Kako has pinched in the sides making it feel quite comfortable when held. 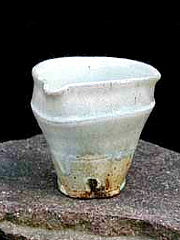 It then bulges slightly at the waist and tapers off to form a perfect pouring vessel. The pouring hole is also just the right size, that which a small finger fits into. Four lines have been etched on the works breaking them up into smaller sections which my eyes enjoy "dancing" over. I also enjoy his ash-glazes. The first time I saw his work at Tobu in Ikebukuro some of the green ash-glazed works reminded me of Ezaki Issei. 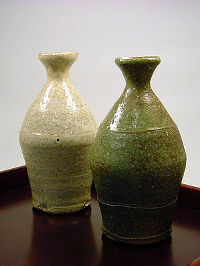 Another pleasing glaze is his kohiki with fine crackled lines suffusing the surface. (For more on Kohiki, please click here.) 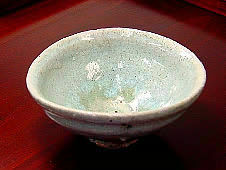 It also has an intriguing green color contrasting with the white kohiki glaze. 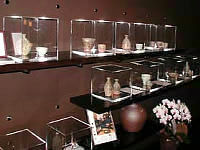 Both of these tokkuri display these two glazes (see above photos). Another glaze I'm very fond of is Kako's "ice" kohiki. Just looking at this guinomi (see below) makes me feel very cool. The shape also is like that of a pool and I sometimes want to get "real small" and just dive in! Again, I can see the sensitivity in Kako's throwing here, particularly just under the lip. It has the feel of an Ido chawan. Kako also fires darker works and some of these are now on display in Tokyo at a new sake restaurant in Meguro. The place is called Sanma. 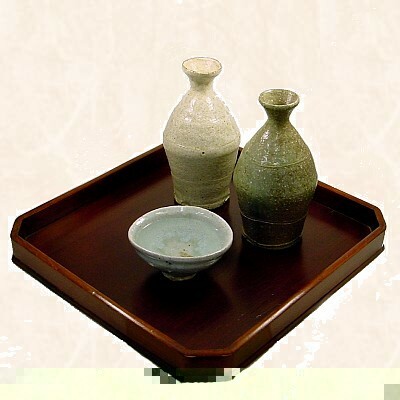 Its theme is for people to meet people, for people to meet sake, and for people to meet shuki (sake vessels). Kako's works, about twenty, are the first to be displayed in this new venue. The food is fine, the sake is tasty, and the atmosphere is relaxing. 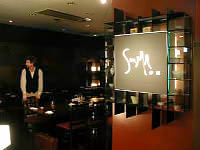 Yet, on top of that is the dimly-lit display area which serves as a focal point for Sanma. 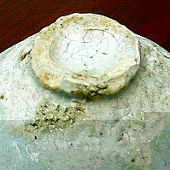 It's here that I hope many people will begin to think about not only the joy of drinking sake, but also the joy in using fine shuki. There are some pleasingly deep Kako katakuchi (spouted serving bowls) with the "ice" kohiki glaze, and some guinomi as well. Some of the open-faced katakuchi do need a better pouring lip though and this would be my only suggestion for Kako's shuki. Otherwise, the works belie his age, and I can see a fine talent here waiting to blossom. His shuki remind me of the work of the late Furutani Michio, whom I adored so much. I'm very much looking forward to watching how Kako's work develops over the years. Until then, I'll just sit back for now and enjoy some sake from his pleasing shuki.